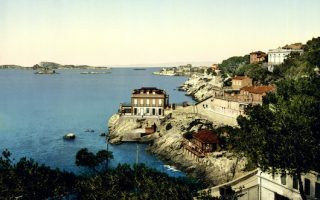 Marseille is the second largest city in France, and its sunniest. Located on the country’s south coast, Marseille is a major commercial, port, and freight center. 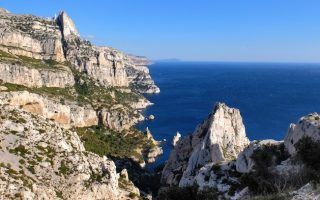 Our guide to running in Marseille features great routes along the Mediterranean, highlights of the old city, and the nearby geography featuring the Calanques, a rugged coastal area interspersed with small fjord-like inlets. 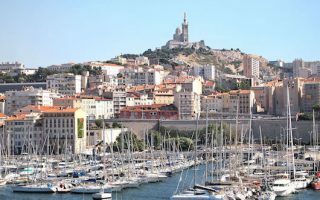 Most of the attractions of Marseille are located in the 1st, 2nd, 6th and 7th arrondissements. The signature running route in Marseille is the Kennedy Corniche, a gorgeous coastal run to the Plage du Prado. That can connect to Parc Borély, a major national garden with some lovely trails. We feature a couple of ‘runseeing’ tours, highlighting some of the old city’s notable sites. 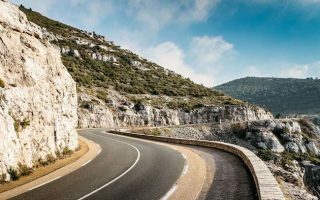 For a great challenge, take the famous road to Cassis, 20 km one-way, and take the quick train back. For a ‘destination’ trail run, head to the Parc national des Calanques. Marseille’s weather is among the city’s star attractions. You’ll need a layer or two in winter, and be aware if the sun and heat in summer. Marseille is an easy city to get around, with 2 subway lines, high speed buses, free ferry in old port. The signature run in Marseille, from Pharo Cove near the Old Fort to Prado Beach. Great views of the Mediterranean along the roadside path, passing above coves and along beaches. 5.3 km one-way, with good bus options for the return. 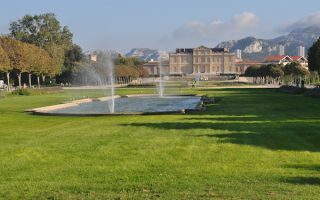 Former Château estate is now a public park with formal gardens, fountains, and a small lake with pleasant cafe. There are lovely paths around three formal gardens, ~2km, plus the 1k Sentier de l'Huevaune (path) on the north side. A 'runseeing' tour comprising many of historic Marseille's most important sights. The 6k short version features the old port, Cathédrale La Major, Vieille Charite and the Maison de la Boule. The longer run adds a hilly 4k RT, on Blvd. Tellene up to Notre-Dame de la Garde. 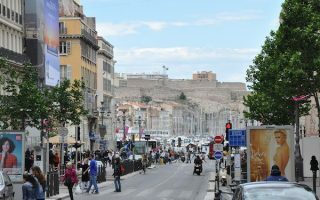 A tour of some of the main commercial areas of Marseille. The highlight is the Canebière, a wide boulevard stretches eastward from the Old Port (Vieux Port) to the Réformés quarter. Several other pedestrian-only streets as well. A spectacular 20 km one-way run along the route of a well-known road race. Great views, and hilly! It's possible to run one-way and take the train back to Marseille. Or, take the train to Cassis, and run the more downhill route to Marseille. A beautiful and rugged national park along the Mediterranean, 15 km south of Marseille. 'Calanques' means 'inlets. Wonderful, hilly trails with great coastal views. Heaven for serious trail runner. There are a few, gentler 'walking' trails good for running. 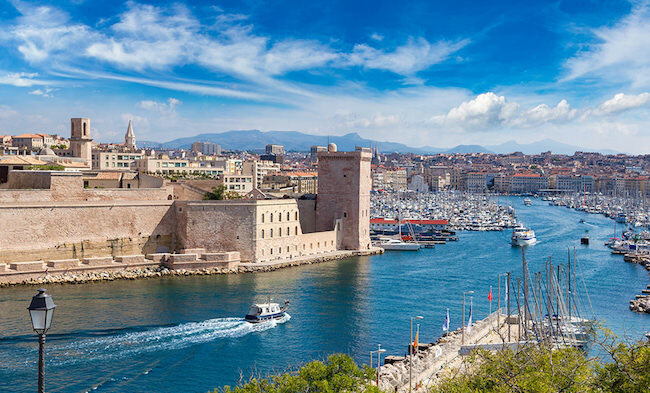 Marseille has a Mediterranean climate with mild, humid winters and warm to hot, mostly dry summers. During winter average high temperatures are 12 °C (54 °F) during the day and 4 °C (39 °F) at night. July and August are the hottest months, averaging temperatures of around 28–30 °C (82–86 °F) during the day and 19 °C (66 °F) at night. Temperatures are slightly cooler near the sea. Most of the 592mm (20 inches) of annual precipitation falls in the winter. Snow is rate, but there are a few days where the temp falls below freezing. Run The World. 6th Arr., near Vieux-Fort. Cap-Running. On the Kennedy Corniche, half-way down. Rando Running. Near Parc Borély.